Nintendo has streamed a live presentation of Xenoblade Chronicles X, which brought 24 minutes of footage that showed off the game's world. It also announced some practical details ahead of the Japanese release on 29th April, such as the availability of pre-purchase downloads on the eShop to speed up launch day access. A notable reveal at the end was for a rather attractive hardware bundle that'll arrive in Nintendo's homeland. As pictured above it'll cost 35,000 Yen ($295 excluding tax) and come with the following goodies. We'd love a similar bundle when this hits the West later in 2015; let us know what you think of it in the comments. I sense a bump in hardware sales very soon! @ThomasBW84 When the release date again over there? Is it before or after this fiscal year? This should push a decent amount of Wii U's in Japan. I'd like to see something like this for the west too. There are a group of people waiting for this game in order to get a Wii U and a bundle like this would help push a few more sales I'm sure. I'm hoping XCX makes it to the US by September! @Spoony_Tech - If by "over there" you mean Japan, Apr 29. As for UK, US - nobody knows. Hardware could use a little something, either on the Gamepad like WW HD had or on the Wii U itself like Sony has been doing w/ PS4, but damn that game box art looks nice. I wonder what the actual box holding all of this in will look like? Gotta be nice. This is one of the games that I'll buy but won't finish. I mean I want to but won't have a lot of time it'll be buried on my backlog. Shame the system is just standard black with no decals of Dolls etc. Everything looks fantastic. My only gripe is why doesn't Nintendo customize the system itself? I mean put a doll on the system just like the box art and I'd import in a heartbeat. All I want is that art book. That box is tempting me to get a physical copy after all, tho....I think the deciding factor if I go digital with this or not will be the impact of the data install on the game's loading times. (if that's really what they hinted at in the famitsu interview). @Gerbwmu - "There are a group of people waiting for this game in order to get a Wii U and a bundle like this would help push a few more sales I'm sure." There were also a lot of people waiting for SSBU and a bundle but that never happened. Considering Nintnedo buried Xenoblade Chronicles as a Gamestop exclusive (US) selling this bundle in the US would be a huge turnaround. I guess maybe, just hopefully maybe, Nintneod can actually learn from it's mistakes, though it never seems too. Still hard to believe Monolith Soft is a Ntineod company, this game, the box art, the bundle, all look too good. Usually have to buy a 3DS for something like this, and a game from Squenix. @rjejr - The fact that they announced localization immediately after the game was announced tells me they are learning a little bit. It seems like some of the choices being made lately are pushing toward what the "internet crowd" wants. We shall see. I could see them doing a limited run of special bundles through GameStop. I think if they announced that it would guarantee it sell out....even though most would be in the hands of scalpers. That might be the best way to push a few million consoles honestly. Limited special edition Splatoon bundle at Best Buy. Limited special edition XCX bundle at GameStop. Limited special edition Mario Maker bundle at Target. Scalpers would be all over them. "It seems like some of the choices being made lately are pushing toward what the "internet crowd" wants"
I've been wondering: why did the West feel the need to name it Xenoblade CHRONICLES X? The Japanese name, simply Xenoblade X, sounds so much better. @Gerbwmu - Scalpers do seem to be Ntinedo's best friend at the moment, even if it is at the expense of the rest of us. Don't know if you gave it some thought or it just came out that way but your choice of bundle locations - Gamestop XCX, Best Buy Splatoon and Target Mario Maker actually all sound reasonable. Guess TRU can get the Yoshi bundle. @ricklongo Because we are stupid in the west and it's more associated with Xenoblade Chronicles this way. Otherwise out stupidity might not be able to discern the difference and think it's a different franchise. Hope they also offer the same minus the Wii console over here in the West. Yes, including the eShop card. I don't mind the extra £10 of credit. I would love that artbook and map with the game, as a special edition. Not of the console, but of the game. And not made available only via GS or NYC store. Well I'm sold. I never played the original for the the reason of availability. I'm not sure the bundle would sell in the US. I think the game will sell systems but I'm not sure if this bundle would drive people to buy a Wii U. If we didn't get a bundle for Smash then I don't see this happening.....and if it does happen, it'll be one bundle per every 10 stores! Sweet bundle ! That box art is amazing ! This is the bundle I have been waiting to get ever since the game was announced. All of that crap better come in a collector's edition in the US, and by all that is good in the world, it damn well better be available to PEOPLE WHO DON'T LIVE IN NEW YORK. If that becomes a collector's edition I'll buy it. So, the Wind Waker HD bundle still is the only one with a special design GamePad? Schucks. I'm really feeling this kind of deal. 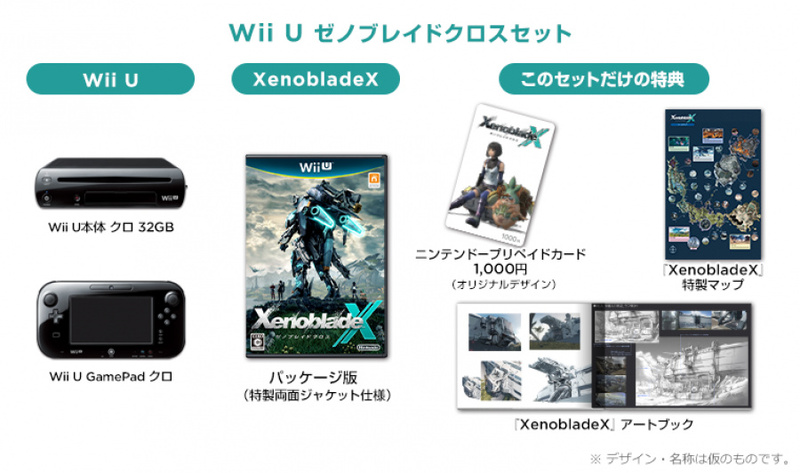 @ricklongo There are some Japanese characters underneath the Xenoblade logo on the case. I admit I don't know Japanese, but my guess is it's not called "Xenoblade X" there either. What's the eShop card for? It's worth noting that the dark Wii U banner on the game cases is only on there if the game is for mature players (M). Intersting, not even Smash got a Wii U bundle in Japan. 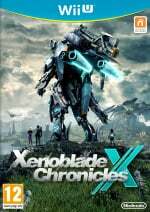 @mjharper : The Japanese title is "Xenoblade X" (pronounced "Zenobureido Kurosu" or "Xenoblade Cross"). The Japanese characters beneathe the title on the Japanese cover is merely a transliteration of the English (and this is the vast majority of the case where a Japanese game happens to have an English title). Oh man, I may very well get this. I just have to remind my wife that at one point she said it would be okay if I got a Wii U and then convince her that she actually meant it. I guess the console is standard black because Wii U hasn't got through its initial 12 million shipment (I think it was that much?) so these consoles are just leftover launch 32GB models. As for the special edition game contents, I'd guess it would come to Europe but not the US (as always). @rjejr yeah i totally agree, it needs something that says this is the xenoblade set, maybe some futuristic blue line art around the gamepad and console face with the xenoblade logo, something other than just ...standard. The dark Wii U banner on the box art compliments it quite a bit! I almost wish they did that for the NA release, haha. If this comes to NA, I'll be sure to recommend that bundle to anyone who has not gotten a Wii U yet. That game case cover looks fantastic. I hope they don't change a thing when it comes here. YAAAAAAY I just pre-ordered myself one of these things!! !